1 Heat olive oil in large nonstick skillet over medium heat and cook shallots, stirring occasionally, until softened, about 5 minutes. Stir in mushrooms, thyme and garlic and cook, stirring frequently, until mushrooms are softened and juices have cooked off, about 5 minutes. Stir in parsley and remove from heat; let cool. 2 Combine mushroom mixture, ground beef, panko and 2 Tbsp. Hellmann’s® or Best Foods® REAL Ketchup in bowl. Shape into 4 patties. 3 Spray nonstick skillet with no-stick cooking spray and cook burgers over medium-high heat 3 minutes. Turn burgers, reduce heat and cook until desired doneness, about 2 minutes for medium-rare. Top, if desired, with your favorite cheese. 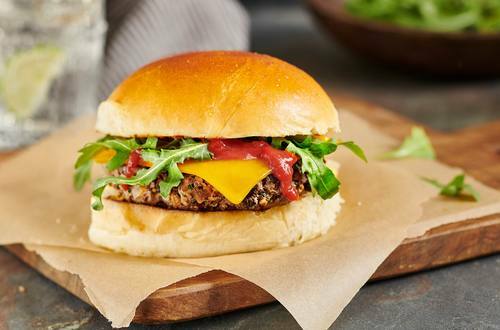 4 Place burgers on bun bottoms.Top each with 1/4 cup arugula, 1 tablespoon remaining Hellmann’s® or Best Foods® REAL Ketchup, then bun tops.